Pockets are fun to add here and there — and they provide a way to insert loose items into an art journal, as I have done here. I created this pocket by cutting the right page in half, and then securing the top and bottom with double-sided tape. Voila! Throughout this art journal, I re-introduced photos and images that I had torn out of the book during “thinning” (when I reduce the number of pages in the book, allowing room to add new goodies). The image on the left is an example of this. I cut this image from a page torn out of this book, and then glued it back in elsewhere. The background of this page was made using Distress inks, a blending tool, and a stencil. I added washi tapes and vintage postage stamps, and rubber stamped cancellation marks onto some of the stamps to anchor them visually to the page. The two slide-out images (contained in the pocket) have “pulls” on them: one made using the Tim Holtz Tag Press, and the other made from a punch. 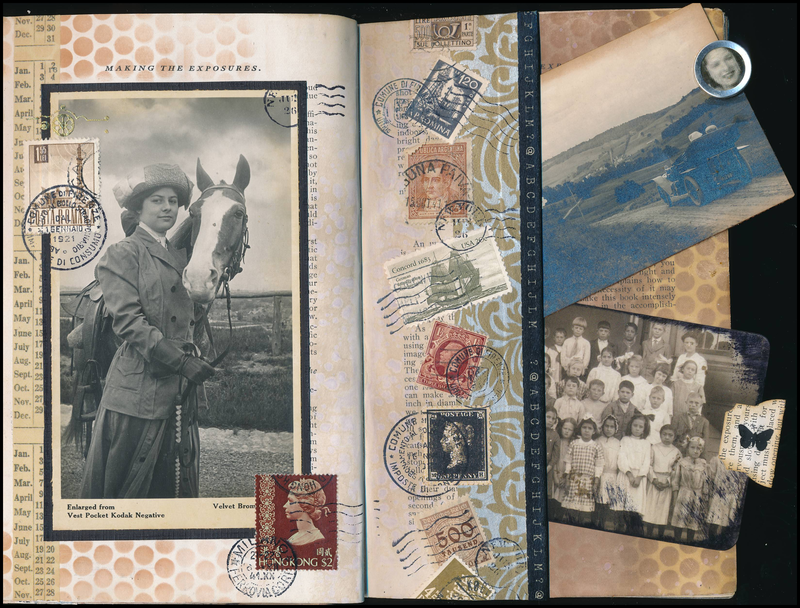 The top image of a vintage car was another photograph cut from the book; the lower one is a Tim Holtz “Found Relatives” card. I love all things Tim Holtz!